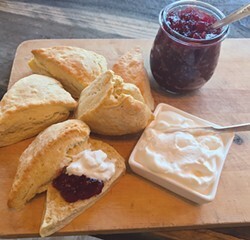 Scones and sympathy, with cream and jam. As a 20-year-old, I took a year off from the sunny, politically charged campus of Berkeley to study abroad. Considering myself a quasi-intellectual, I chose a country known for it's moody skies, great writers and charming pubs. Arriving by ferry across the Celtic Sea, the cobblestone streets of Cork, Ireland, became my home for the next year. I lived in a storybook house on a bridge and, like an Irish Harry Potter, my mailing address was simply: Wellington Bridge, Cork. My Italian roommate's name was Lisa — pronounced like Pisa and similarly tall, dramatic and beautiful. We wasted no time getting into trouble together. Drinking pint after pint of Murphy's, the velvety chocolate brew of southern Ireland, we'd stay up until 4 a.m. dancing with the other foreign exchange students. I was "going for a pint," as the Irish say, far more than I frequented the university. Evenings, I waited tables at a charming bistro called Fenn's Quay, where the upper crust of Cork filled the dimly lit room each night. Tables drank bottle after bottle of wine and everyone ordered dessert. After closing, the staff sat around drinking together, eating the nightly special. These meals — usually something like monkfish, asparagus and potatoes — comprised my weekly ration of vegetables. The Murphy's, the potatoes, the chips ... Oh my goodness, the chips! They came with everything, even the monkfish at Fenn's Quay. When ordering chips at the gyro stands scattered across Cork, they'd ask, "Curry or cheese?" Meaning, would you like your French fries covered in cheese or a cheesy curry sauce? I started the New Year with a dismal resolve. It was 2005 and Facebook had yet to take control over the metrics of my happiness, but behind the seams of my tightening waistline, I missed vegetables, hummus, sunshine, yoga, hippies, my family and the Pacific Ocean. Recovery from the Irish habits of overindulgence was a slow one. I don't mean to point a finger at dear Ireland. It's a culture moored by humble kindness and good cheer — not its produce selection. I had simply taken for granted the good health that permeates Northern California, inadvertently feeding my homesick melancholy. With five months left in the school year, I scaled back my visits to the pub. I started jogging again, collecting odd glances from the Irish locals shuffling between church and the pub. Adopting the Irish habit of afternoon tea, I started walking to town with Flannery O'Connor in my book bag. 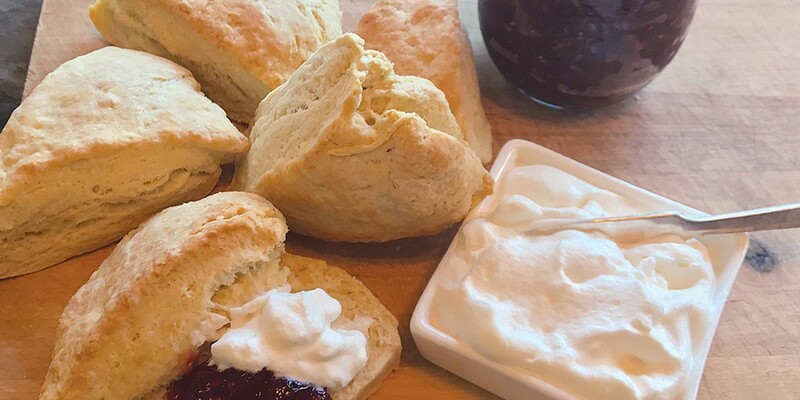 When ordering tea in Ireland, the barkeep simply asks, "Scone?" followed by, "Cream or butter?" Irish scones never deviate from the original art form. Proper etiquette is to split your scone in half, spread your dairy of choice liberally and top with raspberry preserves. I fell hard into the whipped cream camp and would happily pass the afternoons in meditative contentment. There, in the pubs, I found what I'd been missing in Ireland's food culture: a well-honed practice for enjoying what's in front of you and counting your blessings. Use Kerrygold brand butter if possible. Made it Ireland, its beautiful yellow color comes from grass-fed Irish cows. Heat the oven, preferably with a pizza stone, to 400F. Alternatively, prepare a baking sheet lined with parchment paper and set it aside. Sift the flour, baking powder, sugar and salt together. Use your fingers to work the butter into the dry ingredients until roughly incorporated into a sandy mixture. Combine the milk and cream. Slowly add the milk/cream mixture, pausing to incorporate it with your fingers. Keep adding liquid until you form a soft, slightly sticky ball. Use the minimum amount of liquid necessary; if the dough is too dry, add liquid by the tablespoon as needed. Once you can form a ball, place the dough on a lightly floured work surface. Using the heel of your hand, gently press the dough into 1-inch thick slab. Slice the dough into 8 equal triangles with a heavy, floured knife. Slide the scones onto the pizza stone or the lined baking sheet. Bake 15-18 minutes. Scones should just turn a golden brown.